"Kate Hefferon and Ilona Boniwell have done an excellent job on this introduction to Positive Psychology! I encourage educators, students and everyone else interested in an updated, well-written and culturally balanced approach to the scientific study of human flourishing, to read this highly accessible, yet rigorously crafted text; and to get it under your skin by ways of carefully chosen tests and exercises." "This accessible, yet comprehensive, book provides an excellent new resource in the area of positive psychology. Students, researchers and practitioners alike will benefit from the skilful and lively integration of theory, research and application. The authors are prominent members of the international positive psychology movement and as such are able to deliver a confident, practical and overarching assessment of the area, integrated into psychology more widely." "This is an exceptional book that synthesizes more than a decade of positive psychology research into chapters that are engaging, accessible, and educational. Hefferon and Boniwell demonstrate a mastery of the literature through the ways in which they have marshaled the evidence from research and practice into this invaluable resource. This book will become an essential reference guide for researchers, educators and practitioners of positive psychology around the world." "This book is a valuable resource for students looking for an introduction to Positive Psychology, but also wanting to get a comprehensive and updated overview of this innovative approach to the study of human behaviour and experience. It provides a broad coverage of the most relevant theories and constructs developed within Positive Psychology, and of their relevance for intervention and application in the most diverse life domains. Hefferon and Boniwell use a rigorous though accessible and friendly style of presentation. By means of effective learning supports, they stimulate readers' active engagement in critical reflections on each topic. 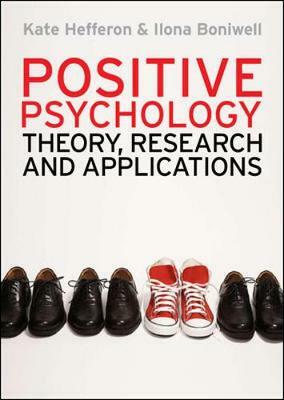 The authors address the several issues and open questions which still characterize Positive Psychology as a relatively recent domain through a balanced and objective approach." "Kate Hefferon and Ilona Boniwell have produced the first textbook which has set out purposefully to support students and teachers in higher education in the exciting new area of positive psychology. The authors have experience of teaching the lectures described in each chapter and the book is written in a way that students will find engaging and fun. Each chapter has clear learning objectives, mock essay questions, measurement tools, summaries and a guide to further resources. The content has been well researched and the early chapters cover the main concepts of positive psychology such as emotions, happiness, wellbeing, optimism, and resilience. The later chapters are more novel and cover interventions and applications all with a critical eye. Of particular note is the chapter on the body in positive psychology - a topic which is frequently omitted from the 'thoughts and feelings' approach of other texts in this area. I would strongly recommend this book to all students and teachers of psychology." "The text is well written, clear and engaging making it an invaluable resource to those seeking an introductory text or for a more comprehensive coverage of the applications of positive psychology. I would highly recommend this text to all students and higher education lecturers studying or teaching the psychology of happiness and wellbeing." "The authors utilise their own multidisciplinary experiences in the field of psychology in an endeavour to provide an effective textbook to accompany university level courses on Positive Psychology, an endeavour which appears to have been accomplished with a high degree of success." Discover the latest research findings and thinking on the topics of happiness, flow, optimism, motivation, character strengths, love and more! Find out how happiness levels can be increased, what stops us from flourishing and how positive psychology can be applied to many professional disciplines. Personal development exercises to help you meld together research and application Mock essay questions to get essay writing goingThink about it boxes to get you thinking about the concepts and theories discussedExperiments boxes giving you most influential positive psychology experiments to dateSuggested resources guiding you where to go nextMeasurement tools presenting popular positive psychology toolsTime out boxes on key issues, concepts and thinkersChapter summaries to help you check their understandingReview questions to enhance your learningPositive Psychology is key reading for students taking modules in positive psychology and well-being, and will also be of interest to students of applied, coaching and sports psychology, as well as psychologists, coaches, counsellors and researchers interested in this burgeoning field.